After a long hiatus from cooking due to my hectic life and schedules, I am back with a healthy, vitamin C-loaded dish. Everyone needs greens and I thought I would share this very special vegetable with you–chive buds. 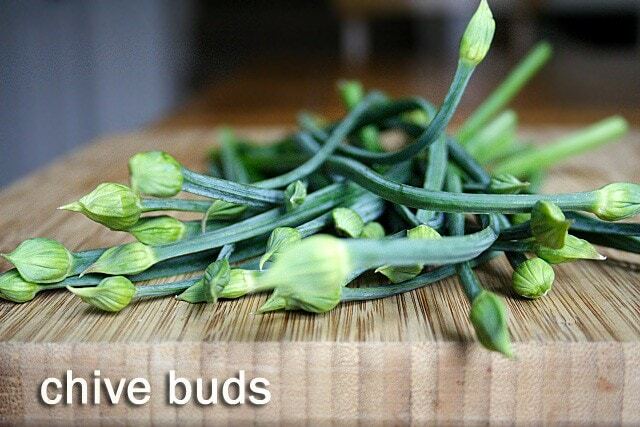 I love chive buds; they’ve got taste, texture, fiber, and those delicate little buds that are pretty and edible. 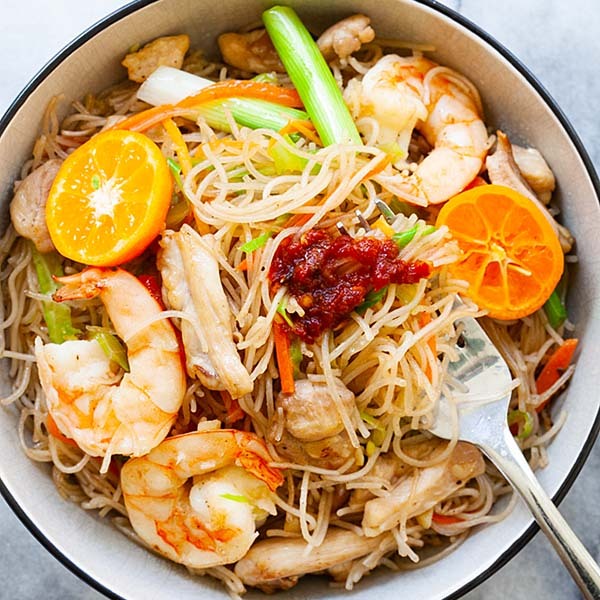 For this recipe, I used some straw mushrooms, scallops, and shrimps. 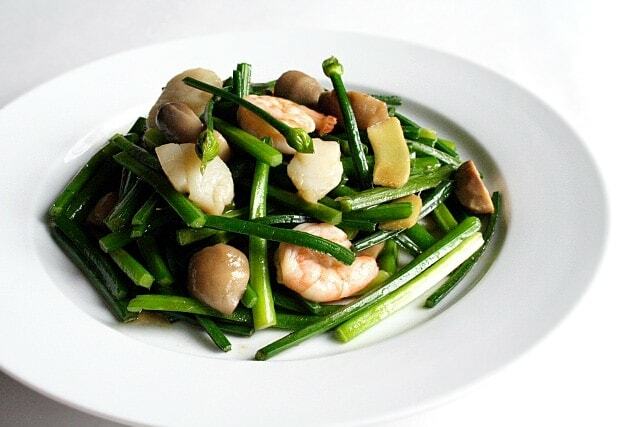 Toss in some oyster sauce, sesame oil, Shaoxing wine and you will have a restaurant quality stir-fried dish. Really. Can you smell the aroma coming out of my picture? Mix the corn starch with water, set aside. Heat up a wok and add in the oil. Add in the sliced ginger and stir well until you smell the gingery aroma. 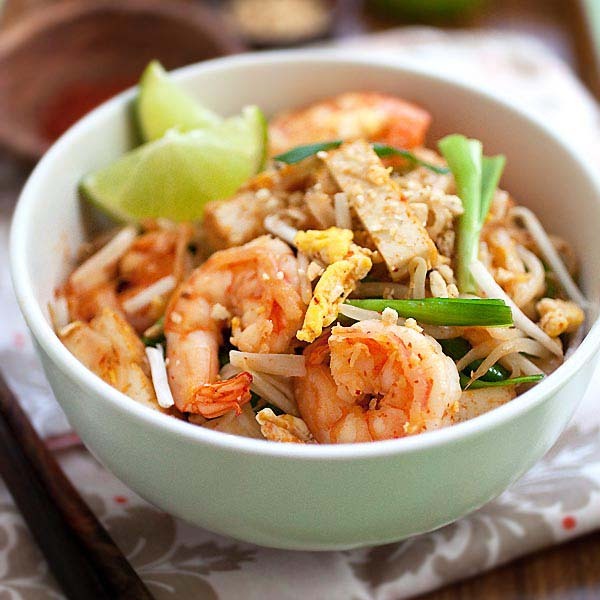 Add in the shrimp, scallops, and straw mushrooms and stir fry for 1 minute. Add in the chive buds and continue to stir fry for 1-2 minutes. Add in the seasoning (oyster sauce, fish sauce, sugar, sesame, wine) and the corn starch water. 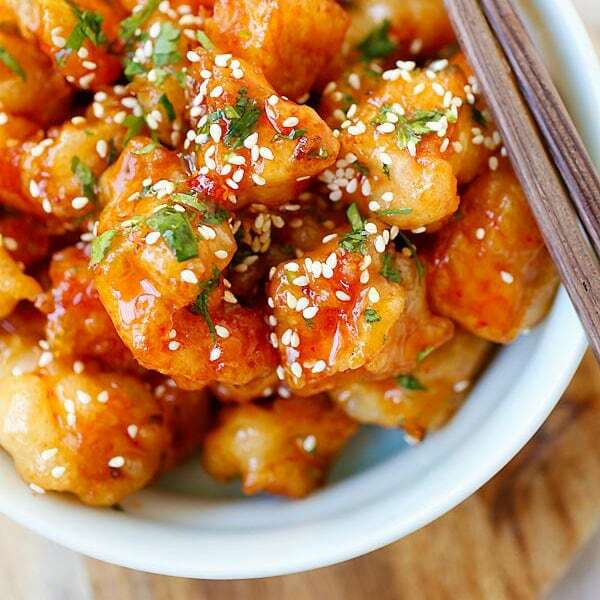 Do a quick stir for 30 seconds, dish up and serve hot with steamed white rice. Do not overcook the chive buds. They should remain a bit crunchy. Ben voyons…looks astonishing, the last picture with the small white tiny smoke! Perfect! I will not do that since it is just impossible to find these chives…too bad ! 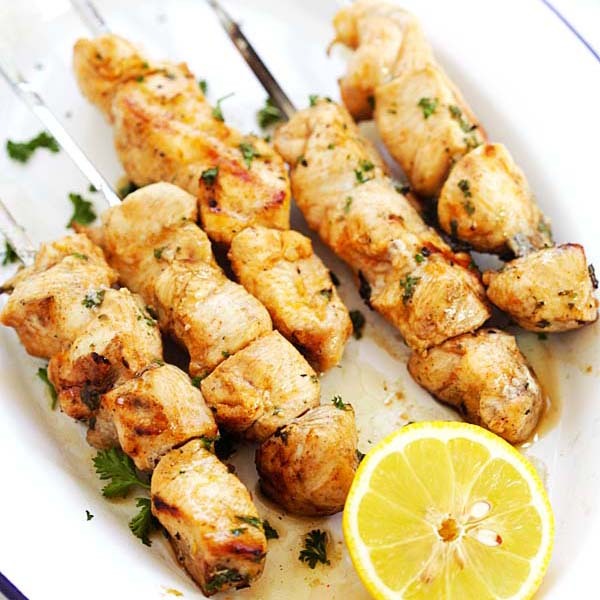 I have this recipe too but the simple no-frills version. If skin of stalk is peeled correctly, the stalk is very sweet indeed. Isn’t this the same as leek flower?? Rasa, from where can I find chive buds? yes i can smell it! yummmmmmm :) i’ve never seen chive buds at the market, i’ll keep my eyes peeled. Beuatiful pics! Delicious! What beautiful and mouthwatering photos! I’m saving this recipe, I love chive buds. Delicious looking. SO fresh! I have never tried to cook these this way, great idea! I haven’t had chive buds in a long time. Was this inspired by your recent trip to Beijing? Wonderful recipe, and great timing — I have chive buds in my herb garden! That looks really simple and refreshing. I really don’t know what these buds looking veggies are called but thanks to you I know now. I keep seeing them in the markets but never tried them before. Babe – yes, with tau kua is a great idea. Thanks for sharing. Marvin – I got mine from Ranch 99. It’s seasonal I believe because I don’t see them often, but when they are available, I always buy them. Nate 2.0 – no, they are not Beijing-inspired. I have always loved chive buds…been cooking them since I got here to the US about 10 years ago. Hehe. Lydia – WOW, you have your chive buds that you could just “pluck” from your herb garden? I am so green with envy, how convenient. I want I want, hehe. Steamy – me too. It’s hard to cook something with aroma like that, I was busy snapping away when I saw that tiny little smoke coming out of the heap of chive buds. Amazing! Stumbled upon ur blog n I’m just amazed by the pictures-did youreally take them urself? ?What kind of camera and any tips on taking pics of food? Ur pics are simple, colorful and just awesome! Those raw vege in your pic do look quite alive – snaking some peeks. Wow! What a mouth-watering dish! I like lots of chives with my char kuih teow. For a quick simple dish, taugeh stir-fried with chives is ok for me but it would be better with a taukwa and a sprinkling of salt fish. Your chives look so beauty and so lifely like they are flying out of the picture. My compliment to you. Do drop by our new site bigboysoven.blogspot.com. We will be launching 1stJune2007. Hope to see you there. Well done mate!!! There are green and white chive buds, right? I remember green buds are usually used to make kuih and the white ones usually to fry prawns and even with noodles. Such a lovely post! 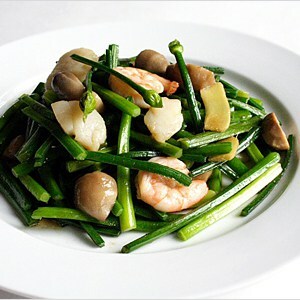 I like chives especially in lamb salad – stirfry chives (with buds) in the same pan used to sear lamb meat. Serve with the pan seared and slice lamb (well marinated with Maggi seasoning and chopped garlic), roasted beet root slices, chopped roasted walnuts and crumbled feta. Drizzle with dressing of balsamic vinegar/olive oil/garlic/Dijon mustard and a bit of honey. Hi RM! What a coincidence,- I just got a bunch of these today from our local chinese gourmet store. I cook them the way you do too. They are called ‘Kau Choy Far’ in Cantonese. Translated in English literally, it’s called ‘Dog flower vegetable’! Funny isn’t it? I do, I do :). I love chives but have never had chive buds. Pics and dish looks superb. Can substitute the Shaoxing wine/rice wine with something else or not? OR can I do without the wine at all? Tummy – you are right…they were snaking around…LOL. Teckiee – Never mind the name, as long as you know how to pick them out from others. Hehe. Big Boys Oven – welcome and thanks for your note. I checked out your site…hope to read more soon. Tiga – I don’t know about green and white chives…in the US, I only see the green kinds. LOL! For the love of food – LOL, dog vegetable flower, that’s too funny. But you are absolutely right, it’s called “kau choy far” in Cantonese. thanx 4 ur tips on food photography; really nice of u to share. carry on with ur wonderful pics and recipes! Iv never had stir-fried chive buds before but il surely try your stir-fried chive buds recipe. Rasa, AMAZING. We made this with fresh chive buds from our garden this evening with shrimp and shiitake mushrooms (no scallops) and it was perfection. I used your secret shrimp preparation tip as well and I think it helped. Thanks for a great, refreshing, and delicious meal suggestion. Normally, chives are just a topping for baked potatoes. This recipe is amazing. My husband woke up still talking about that. Bee you can’t get much better than someone waking up and talking about your meal from last night!! Many thanks for another great recipe. You are the best! That’s great that your husband loves it! !